06 Oct 2013 Another Mile Stone – Important day in my life.. Have you also confirmed your Bib! As some said other day – Side Effect of my First half Marathon was – registering for Second one!! 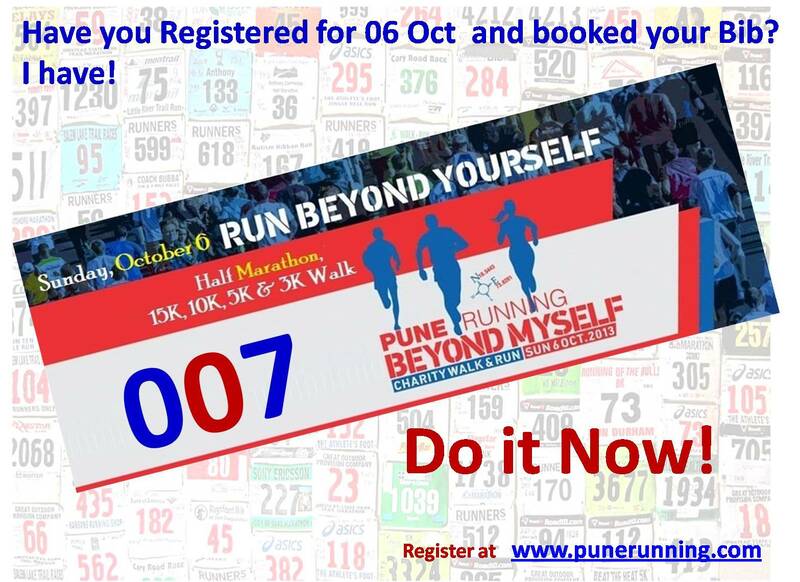 It was great to register for another Official Half Marathon (06 Oct 2013 – Pune) and this time with all Technology – running chip in my shoe and my timing flashing at the finish point letting others know how am i doing; what an experience it is going to be! I have never run in such an event, supported by such gadgets. In the Army, i always had a whistle to hear and some senior / instructor shouting “GO”. And off we went running – doing our bit by completing whatever distance given, to be received by someone, giving dirty looks and saying ‘bad’; probably that guy at the finish line never was happy with anyone, and kept pushing us every now and then. This time, it is going to be something different at the finish line, with some nice faces around (definitely not that someone with dirty looks! ), everyone receiving everyone in good mood with refreshments, nimbus and fruits and am going to earn a Medal + Certificate. As I now suspect, the side effect of this Half marathon is going to be registering for another half / Full Marathon; but then who cares! As long as I enjoy it and find some good healthy environment with no visits to Doctor- great – I must continue..